FL4000 OEM-style acrylic rotameters are precisely machined from rugged, solid acrylic blocks for superb durability. They are available in 50 mm, 75 mm, 127 mm, and 250 mm scale lengths (1.97, 2.96, 5 and 9.85") to provide desired accuracies from 2% to 6%. Designed for front-panel mounting, the rear ports extend through the panel for easy hookup. Mounting threads are also provided. 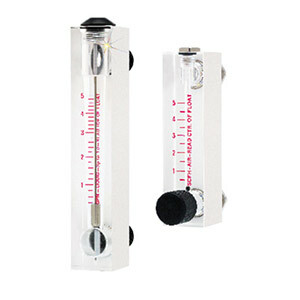 Units are available with and without valves. * Minimum flowrate = 10% of maximum flowrate listed. For a 5-point NIST calibration certificate, add suffix "-NIST5" to model number, add $250 to price. For a 10-point NIST calibration certification, add suffix "-NIST10" to model number, add $350 to price.